Supports all the glands in the body - the Thyroid, The Pancreas, The Adrenal Glands, pituitary gland and more. Take one (1) capsules three times a day. Usage may be increased according to need as directed by health care practitioner. Each endocrine gland has one or more specific functions, but all are dependent upon other glands for the maintenance of a normal hormonal balance within the body. This one of a kind formula is uniquely designed to supplementally support the entire endocrine system for encouraging regular menses and supporting low energy, lethargy, and fatigue. 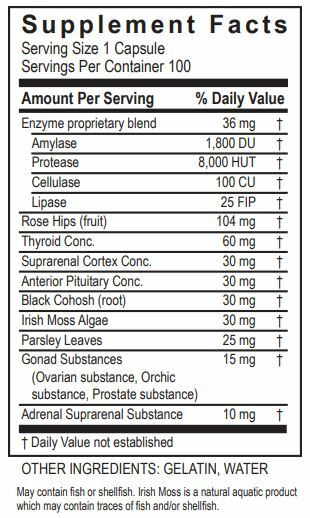 MasterZyme™ includes adrenal, thyroid, pituitary, and gonadal tissues specific to the endocrine and reproductive systems. The comprehensive glandulars in this product are highly tested for purity and safety to naturally feed and fortify the thyroid, suprarenal cortex, anterior pituitary, ovaries, and prostate glands. Black Cohosh and Irish Moss are known for their ability to support thyroid function. Rose Hips are a natural source of antioxidants and vitamin C. Enzyme Blend. This formula includes amylase, protease, cellulase, and lipase enzymes for improved absorption and delivery of the various ingredients. Haven't taken it long but it is doing a great job.. This product has helped me with menopause syptoms. Defintly helped with foggy thinking . Won't go off it till I am thru this time in my life. Thank you for such an awesome product. I've been taking this for awhile now because of just been to stressed out and having high blood pressure and on top of it all I already have a bad heart, this really helps to calm me down relaxes me and keeps my heart in a nice rhythm. With taking this supplement I notice a big difference and when I forget sometimes I can really tell the difference! It helped me feel a lot better within a few days. I had ran out, and was feeling bad again. Click the button below to add the MasterZyme to your wish list.